Mumbai, IN – May 5, 2018 – Adapty, a digital technology solutions provider, partnered with Saviesa, a home improvement retailer, to develop its digital landscape that includes its Website, Storefront and In-Store mobile app. The Adapty team leveraged its omni-channel expertise to help plan, strategize and develop Saviesa’s technology infrastructure and solution. Adapty provides customised digital solutions and technology expertise, backed by a strong local and off-shore development capability. “Adapty and Saviesa partnered to deliver a set of unique mobile based customer experiences and design solutions called ‘Saviesa Dream Builder’ and ‘Saviesa Dream Viewer’. These innovations have emerged from our deep understanding of the market and customer needs” says Rajesh Ahuja, Founder, Saviesa. “We are pleased to be a strategic digital technology partner for Saviesa and look forward to laying out comprehensive digital landscape for its business leveraging our expertise in digital strategy and deep experience in providing customised retail solution. At Saviesa, we are re-defining the customer experience in the modular furniture and home improvement segment.” said Vijay Talreja, Co-Founder, Adapty. Adapty is a leading digital commerce company. 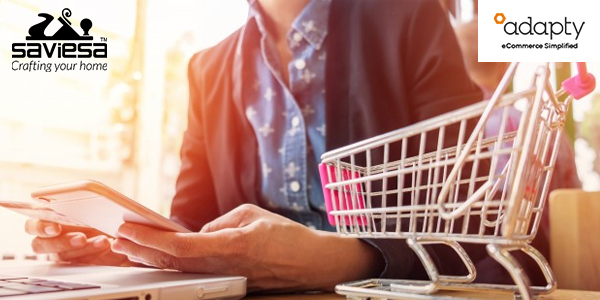 As experts in digital commerce platforms, our technology teams design and implement omni-channel solutions that drive customer engagement and business growth. We help retailers adapt to the rapidly changing business environment. Saviesa, founded by the pioneers of the modular kitchen industry in India, is dedicated to making the lives of their customers better by expertly crafting their dream homes. Utilizing knowledge and expertise gained in the field, over 2 decades, Saviesa provides their customers with world-standard modular kitchens.